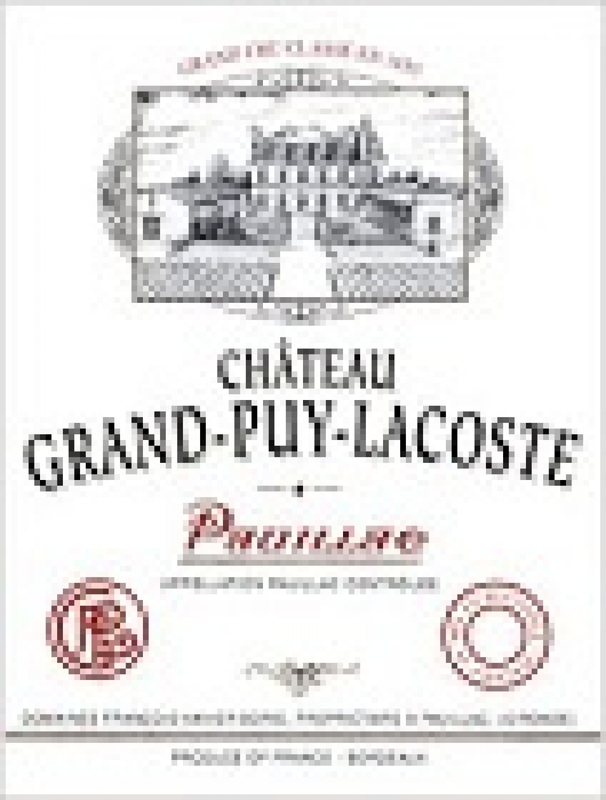 "Jeannie Cho Lee" has rated the wine "2013 Chateau Grand-Puy-Lacoste, Pauillac, France" from the vintage 2013 on 01.04.2014 with 91 of 100 points.
" Subtle and layered with layers of dark berry fruit, cedar and spices. This wine has a lot of depth and a substantial core which is surprising given the vintage conditions. Very long finish. Tasted in: Bordeaux, France. Maturity: Young. " "La Revue du Vin de France" has rated the wine "2013 Chateau Grand-Puy-Lacoste, Pauillac, France" from the vintage 2013 on 01.06.2016 with 16 of 20 points. "Wine Spectator" has rated the wine "2013 Chateau Grand-Puy-Lacoste, Pauillac, France" from the vintage 2013 on 31.03.2016 with 90 of 100 points. "Jeff Leve, The Wine Cellar Insider" has rated the wine "2013 Chateau Grand-Puy-Lacoste, Pauillac, France" from the vintage 2013 on 10.02.2016 with 90 of 100 points. "Wine Enthusiast" has rated the wine "2013 Chateau Grand-Puy-Lacoste, Pauillac, France" from the vintage 2013 on 03.01.2016 with 91 of 100 points. "Gault & Millau" has rated the wine "2013 Chateau Grand-Puy-Lacoste, Pauillac, France" from the vintage 2013 on 01.06.2014 with 15 of 20 points. "Falstaff Magazin" has rated the wine "2013 Chateau Grand-Puy-Lacoste, Pauillac, France" from the vintage 2013 on 25.04.2014 with 88 of 100 points. "Vinous Antonio Galloni" has rated the wine "2013 Chateau Grand-Puy-Lacoste, Pauillac, France" from the vintage 2013 on 01.04.2014 with 90 - 92 of 100 points. "Stephen Tanzer" has rated the wine "2013 Chateau Grand-Puy-Lacoste, Pauillac, France" from the vintage 2013 with 88 - 91 of 100 points. "CellarTracker" has rated the wine "2013 Chateau Grand-Puy-Lacoste, Pauillac, France" from the vintage 2013 with 89 of 100 points. "Bettane et Desseauve" has rated the wine "2013 Chateau Grand-Puy-Lacoste, Pauillac, France" from the vintage 2013 with 15 of 20 points.